This badge was issued to Blair Brown on 12 Dec 2017. Completion of the prerequisite courses, course curriculum and assessment earns the System Integrator Project Manager Certification. Complete the curriculum and assessment for System Integrator Project Manager Certification. 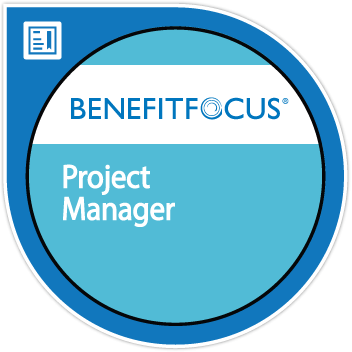 The following topics are covered: Benefitfocus Implementation Phases and Roles, Project Schedule Overview and Implementation Risks. Complete the prerequisite course and assessment for Benefits 101. The following topics are covered: Brief History of Benefits, Basics of the Benefits Industry, Medical Plans, Consumer-driven Health Plans, Life and Ancillary Benefit Plans. Complete the course and assessment for HIPAA Compliance Training. This course includes HIPAA terminology and your role in compliance with current regulations. Other topics include the specific security requirements, policies and procedures used at Benefitfocus to maintain the privacy and security of health information.